I'm really proud to be half Finnish so my Finnish culture and childhood memories of Finnish summers play an important role in my work. I adore folklore (particularly ‘The Kalevala’). Nature/wildlife, Finnish landscapes and the ethereal quality of light on a midwinter's day in Lapland. Also, Scandinavian design from the 50s- 70s. The Kanteleen kutsu fabric depicts forest animals that have, enchanted, gathered to hear the joyful tunes played on the kantele, a plucked string instrument, by Väinämöinen, the main character of the Kalevala. Väinämöinen had made his instrument from the jawbone of a giant pike. The Sampo, a wealth grinding magic mill, is featured in the impressive Taikamylly fabric. 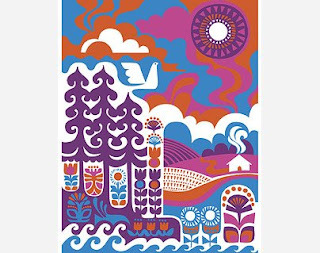 The Ihmemaa art print, sold by the repeat, shows the landscape of Kaleva, the Land of Heroes, and Lake Alue, in whose depths a whitefish has swallowed fire fallen from the heavens. Where would you like to see your patterns used? My ambition in life is to decorate the world with beautiful patterns. To know my fabrics will be in people’s homes makes me feel very honoured. Ik vind de kleuren combinatie echt fantastisch!